Malaysia’s bid to turnaround the decline in its ageing petroleum reserves has exceeded expectations thanks to a series of major discoveries offshore Sarawak. Malaysia has long been a heavy hitter in the petroleum industry, based on worldscale developments such as the Bintulu LNG complex in Sarawak. While it still had abundant oil reserves of about 4 Bbo as of January 2014, the fourthlargest in South East Asia, the longterm future of the country’s petroleum sector demanded new gas discoveries to replace produced reserves. Back in 2010, the government launched a determined bid to address the problem by introducing new fiscal incentives to encourage exploration and development in deepwater and marginal fields. In more recent times it has also been aggressive in response to the downturn in oil prices, with further tax concessions. Marine loading arms at Bintulu LNG port, Sarawak, Malaysia. (Photo Credit: Ahmad Afif Isa/Wikipedia) The resultant new wave of exploration has made Malaysia a star performer in South East Asia in terms of resource growth, accounting for 71% of the region’s discovered resource in 2014, according to Wood Mackenzie. The consulting firm expects Malaysia, and Sarawak in particular, to remain an exploration hot spot, with SapuraKencana Energy (SKE), Shell and Petronas all drilling prospects this year. Petronas is also a major driver of elevated activity in the country’s petroleum sector, despite the price-led slowdown worldwide. 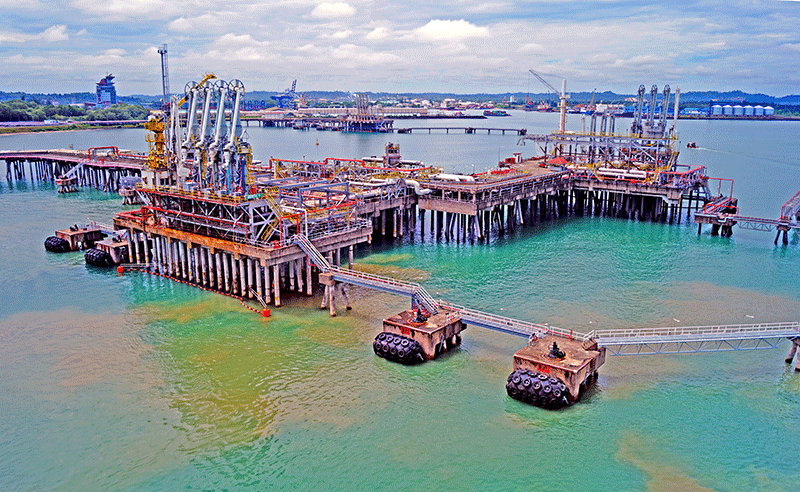 The state-owned company is pressing on with a number of major projects, including floating LNG and a ninth train at the massive Bintulu, Sarawak complex that will lift capacity to 25.7 million tonnes of LNG per annum. Exploration success has been broadbased, with discoveries made by supermajors such as Shell and ExxonMobil and independents SKE of Malaysia and US company Newfield Exploration. The most impressive discoveries of 2014 were made by the SKE joint venture in the SK 408 block in shallow waters, about 120 km offshore Sarawak in the Central Luconia Gas Province. In fact, the joint venture partners of SKE with 40%, operator Petronas with 30% and Shell with 30%, had a 100% success rate with a five-well campaign last year. The final well in the campaign, Bakong-1, encountered a gas column of more than 600m in the primary target reservoir within the late Miocene carbonates. The previous four wells also discovered gas within the same Late Miocene Carbonate reservoirs. The five discoveries to date have found in excess of 3 Tcf of gas in-place. The JV plans another five-well campaign, targeting additional significant potential. Shell made two other gas discoveries offshore Sarawak in its own right in 2014, with the success of Majoram-1 and Rosmari-1 in the deepwater block SK318. The block represented a new play for Shell, which has operated in Sarawak for decades. Rosmari-1 encountered a gas column of more than 450m and followed three other discoveries by Shell in its core areas. In other discoveries, the Bestari-1 exploration well, drilled in April 2015, made a significant oil discovery in Malaysia’s deepwater Block R, offshore Sarawak, intersecting 67m of net oil pay in multiple sand packages within the primary Miocene target. The string of recent successes began in 2013 with one of the biggest petroleum discoveries of the year worldwide – the B-14 well in SK310 block, 80 km off Sarawak in shallow water. Operator of the block, Newfield Exploration, announced it had encountered 480m of net gas pay and estimated gas-in-place of between 1.5 and 3.0 TcF. Newfield subsequently sold the block along with the rest of its Malaysian petroleum assets to SKE in February 2014. The B-14 discovery was made in a pinnacle carbonate reef, and was the second of its kind in SK310. This was followed in late 2013 with the discovery of a 292m gas column at the Sintok-1 well in SK320, operated by Mubadala Petroleum. The new discoveries will add to Malaysia’s production growth, which has begun a resurgence with the recent commissioning of new projects such as Bentara (oil), Phase 1 of the Kumang Cluster Development Phase 1 and the Shell-operated Gumusut-Kakap deepwater oil project. See GEO ExPro Vol. 9, No. 4 for further information about the geology of Sarawak.